Claude Conover Ceramic Vessel Titled "Balakmul"
Claude Conover Vase Titled "TZIN"
Large Vessel by Claude Conover "Kalax"
Claude Conover Stoneware Vessel Titled "Uxue"
A large stoneware vessel by Claude Conover (American 1907-1994) titled "Uxue". Signed on underside. A large ceramic vessel by Claude Conover (American 1907-1994) titled "Balakmul". Signed on underside. A Calude Conover (1907-1995) vase titled "TZIN" with matte cream slips and impressed transected circles over entire rounded body. Signed. A signed and titled glazed stoneware vessel by Claude Conover decorated in engobe. 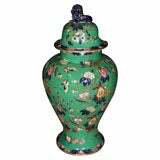 An ironstone green ground vase with with cover topped by a lion finial with floral decoration and gilding. Claude Conover pillow vase titled "OLMA". Rough grey stoneware plant vessel with matte lichen green engobe and visible fire sand texture. The vessel has a hole in the bottom for drainage. Royal Doulton stoneware vase, modeled by Vera Huggins, second quarter of the 20th century.